Blessings, Miracles, &Thoughts in Between: What's Next? Over the past week I've have several people ask questions/ make statements about Will's future and next steps. I've heard everything from "Will is all healed and will go home now" to "how long will y'all be in the hospital?". Basically, people what to know the next steps. While filtering through all of these questions, I've come to the realization that people are a bit confused about the bone marrow transplant process and recovery. While BMT recovery is second nature to me, it just isn't something most people know about so I thought I would help people understand a bit more about what Will will be facing in the coming months. First off, I want to point out that the transplant was the easy part. Receiving his new cells last week did not cure him. It did not complete the bone marrow transplant process. It did not make everything all better. Last Wednesday was simply the beginning of Will's fight for life. Yes his chemo was hard on his body but what he is facing over the next year is even harder. As of now, we are waiting for Will's new cells to engraft. This typically takes 14-21 days post transplant. If he has not engrafted by day +30, the transplant is deemed a failure and we will start all over again with chemo and a second transplant. While I do not even want to entertain that thought, it is a possibility that we have to keep in the back of our minds as it does happen. Kate's friend Colt dealt with this and had back to back transplants due to his first not working. Engrafting occurs when a patient has an ANC (absolute neutrophil count) greater than 500 (or 0.50) for three consecutive days. The chemotherapy Will received completely depletes the bone marrow. This means Will's ANC should theoretically drop to 0 before it begins to increase. I say theoretically because some patients never truly reach and ANC of 0.00 but get pretty low. As of today Will's ANC is 0.09 (which is considered 90) and I am expecting it to drop a bit more before we see any upward movement. Low white cell count/ low ANC means a patient does not have the ability to fight off infection. Because of this Will is on several prophylactic medications (antibiotics, antivirals, antifungals) to hopefully prevent infection. Will will remain on these medications for months post transplant. Since the goal of Will's chemotherapy regime was to completely deplete his bone marrow, Will is also facing low red blood cell and platelet counts. He is being supported via platelet and RBC transfusions. Platelet transfusions are given when his platelet count drops below 20 and red blood cells are given when his hemoglobin falls below 8. Right now Will is getting RBCs about every 3rd day and platelets every 2-3 days. On top of the blood related side effects of chemo, Will is also dealing with something called mucositis. Mucositis is the inflammation and ulceration of the mucous membranes lining the GI tract. As of now, Will has open sore in his mouth and down his throat which is causing him lots of pain as well as causing him to vomit blood regularly. Breakdown in the diaper area is also a common side effect of mucositis but as of now Will is not experiencing this. As a patient's ANC plummets, their mucositis gets worse. We are hoping that Will will start getting some relief when his counts start going back up. The chemotherapy Will's received also destroyed his immune system. Because of this he will receive IVIG on an as needed basis until his body can start producing antibodies again. Will is also on immunosuppressive medications in order to decrease the risk of graft versus host disease. While these medications are necessary for his body to accept his new cells, and fully recover, they put him at a higher risk for developing infection (which could be potentially life threatening). Because of the lack of immune system, Will will be on isolation as soon as he is discharged from this hospital. This means he will literally only leave our house to go to doctor's appointments three times a week. It also means that we will not allow people inside of our home for at least 8 months due to the risk of germs/ infection. There are other possible complications (infection, liver issues, graft verses host, kidney issues, lung issues, blood pressure issues) that can spring up at any point post transplant. They typically appear within the first 100 days post transplant but major organ issues can occur as far as a year out. Those of you that followed Kate's journey may remember the kidney issues she developed 4 months post transplant. As far as discharge goes, that is not even on our radar right now. Kate was in the hospital or 40+ days and I am expecting a similar time frame for Will. We've been here 17 days so far and I'm certain we have several more weeks to go! We are hoping and praying that Will can avoid many of these scary complications but are realistic and know that avoiding complications and re-hospitalization is nearly impossible for BMT patients. So as y'all can see, Will is very far from being deemed healthy. Even once his cells have engrafted he will still have many mountains to climb before we can claim his transplant a success. We've got months of worrying, praying, and hoping that these new cells will be Will's answer to a living a long life! I hope this helps y'all better understand the BMT recovery process and if anyone has any specific questions feel free to leave them in the comment section and I will try my best to answer them this week! Praying! I am unable to read your blog on my IPhone for some reason, but I wanted to let you know you have prayers throughout the country. Thanks for letting people know about the BMT process. I know from experience that it is hard to explain to those who think it is a transplant like a heart or lung transplant. 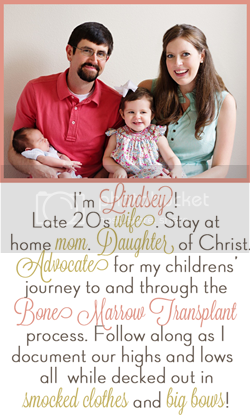 Lindsey, you truly are an angel that could put on this earth to care for sweet little Will (and Kate!). Reading this brings tears to my eyes because I don't think I could ever be as strong as you are. Continuing to send prayers your way. Thank you so very much for your in depth description of all that needs to occur. I will be praying specifically for Will in those areas. But also praying for the rest of your family, as I know how having a sick child affects everyone. We have no idea the heartbreak that your family has experienced, but we do rejoice in a God of miracles, and pray that He blesses all of you tremendously. With prayers and admiration!!! Thanks for sharing this, Lindsey. Really helped answer a lot of questions and gave us more ways to have specific prayer requests for Will. You are one amazing mom to 2 special babies!